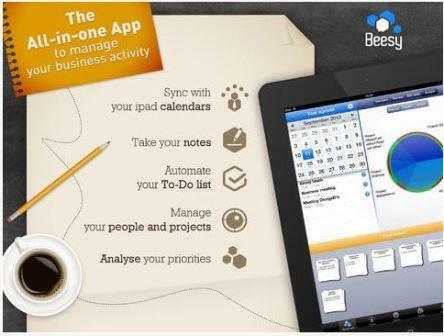 How To Manage Your Projects From iPad With Beesy: If you looking for an app that facilitates you to manage your tasks from complex projects, then Beesy is the app you need, as it is a very complete application that allows you to easily take notes meetings, school or track projects appointments with the staff and the review of the projects. Beesy always aims to keep updating this information: if during an interview with your Collaborating , some tasks are updated. On the other hand , Beesy adds a certain number of features designed to help you be more effective in meeting and manage your iPad To-do . A smart function that learns from your vocabulary single professional, people you know , of project on which you work . A vision if you want by meeting, by type of task , person or project . A second supplementary filter suits each of the previous views . For example , a given project , a selection of your actions per person. Dual -Touch Drag & Drop to change easily the context of an action . Drag an action on a project , the action affected this project stay . CSV Support for external analysis . Tool « reporting » Integrated Matrix urgent / important , graphics by projects, task types or people. Taking notes according to the context: Everything you write automatically to the context with which you associate your Person, expiration date , projects, meeting. This way you can concentrate on your partner , Organization in the form of task : Each note can be an action , and a derivation of a task: Action , send a document , call someone , an idea … For each task type , per-defined values ​​, configurable let you not have to configure anything during your meeting. Access your calendar Beesy and ability to create a note associated with a meeting from your calendar. Beesy identify participants and create a relation between notes and calendar. You can get Beesy from the Apple Store.